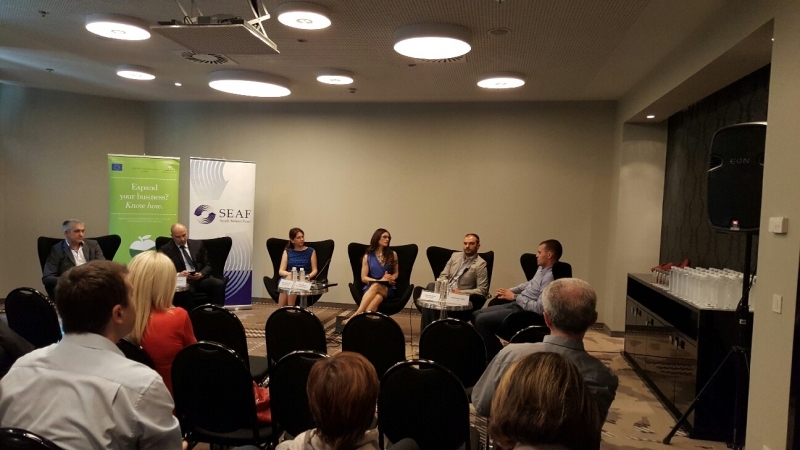 Conference panel “Development compared to the financial influence of private equity investments” was held last week, by Serbian Private Equity Association (SPEA) and Small Enterprise Assistance Funds (SEAF) in Falkensteiner hotel in Belgrade. The conference was opened by Lorena Macura, investment director of SEAF fund and member of board of directors in SPEA. 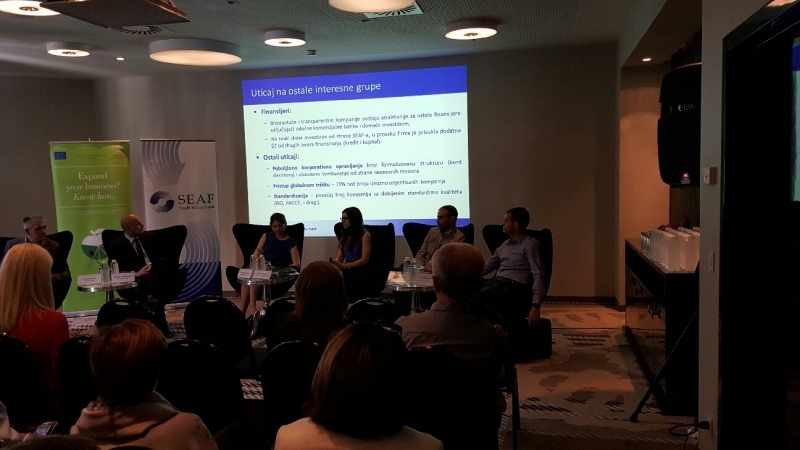 After her introduction and presentation about the experience of the SEAF fund, Mrs. Macura called upon the panelist to present their own experiences related to their work with funds and financial development institutions – Goran Radojevic (ЕBRD), Ninoslav Milenkovic (JUGO-IMPEX E.E.R. ), Aleksandar Maric (ADORE CHOCOLAT), Aleksandar Zatezic (JEZ) and Suncica Damljanovic (Dam-Mont Industry). The main goal of the conference was to present additional values that PE funds offer to their portfolio companies in addition to financial resources for further growth. Using a case study of SEAF on global scale, Mrs. Macura presented the influence that investments of this fund had on all relevant stakeholders including employees, costumer, suppliers, local communities, funder and the country. ‘Study results as well as detailed case studies done by SEAF Fund show that the multiplier of measured influence is substantial: every $1 invested in the company generates additional $13 into the local economy on average. 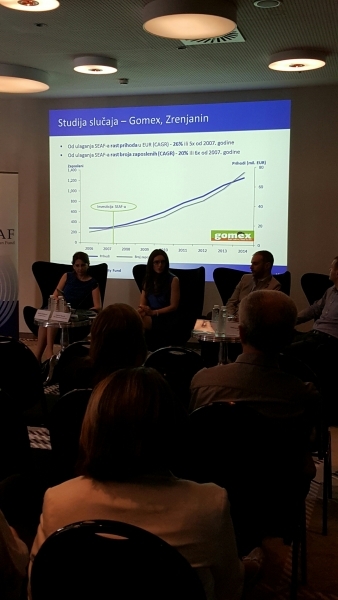 In financial terms, development value of SEAF’s investments of 83% is considerably bigger compared to the financial return of investment of 23%’, pointed out Mrs. Macura. ‘In more developed markets that have well established social institutions, the impact of private equity investing is largely measured by tracking financial returns. 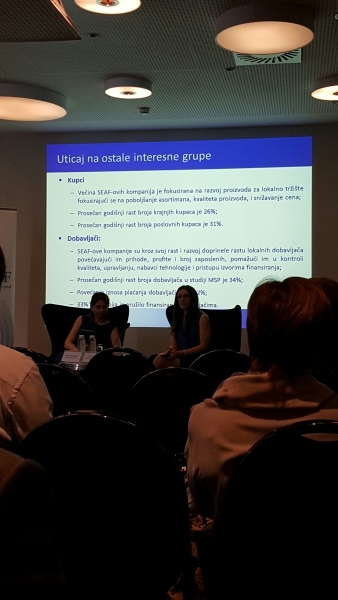 In the developing economies of Southeastern Europe it is important to take a more holistic view of the impact of private equity investing to measure the contribution of such investments with respect to the development of the overall economy.’ Added Serbian Private Equity Association President David Schoch.